(3 Customer Reviews) | Write Review 13 issues per year Practical Poultry magazine is packed with helpful advice from incubation to housing, feeds to breeding and shows to marketing. Practical Poultry is an informative monthly magazine that caters for enthusiasts at all levels from beginners with just a few chickens to established breeders working on small scale commercial production. 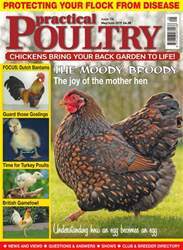 If you keep poultry, you need Practical Poultry magazine. Looking for Practical Poultry in print? 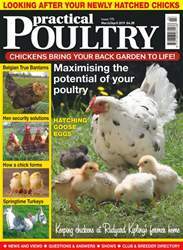 Unfortunately pocketmags.com does not sell print copies of Practical Poultry, but all is not lost. Our partner at magazine.co.uk sells print subscriptions at the best prices online. consequences are more inclined to be fatal. So I was pleased to see that the Poultry Club of Great Britain is taking the initiative and doing something positive to help. The launch of its Flood Support Helpline is intended to co-ordinate assistance for those pure breed keepers who have been hit hardest by the recent weather (see the news story on p6). It’ll be very interesting to see how this project develops, and I hope that, in the months to come, we’ll be able to report on some heartening tales of breed enthusiasts coming together meaningfully to help those less fortunate than themselves. 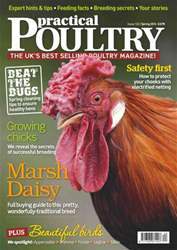 Practical Poultry magazine is packed with helpful advice from incubation to housing, feeds to breeding and shows to marketing. You'll receive 13 issues during a 1 year Practical Poultry magazine subscription. Reading this mag gives me enormous pleasure. The layout is excellent and the articles are very informative. A brilliant read. 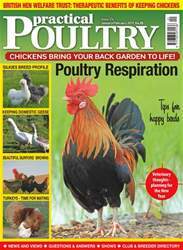 You'll receive 13 issues during a 1 year Practical Poultry magazine print subscription.